The Friends of the Los Banos Library maintains an online bookstore. We currently have some great books and CD's. Please stop by and check out our selection! Thursdays (Weekly) 10am-11am, at the Los Banos Library. Stories, Songs and Rhymes for Preschoolers and their families. They'll have a Wiggling Good Time! 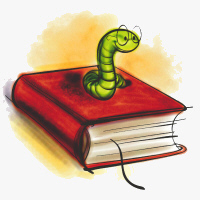 Wee Wigglers' is organized and promoted by the Los Banos Rotary Club as one of its literacy promotion efforts. FREE! Saturdays (Weekly) 10am-11am. at the Los Banos Library. Bi-lingual Stories, Songs and Rhymes for Preschoolers and their familias. Para los Ninos is organized and promoted by the Ceasar Chavez Committee. FREE! Los Sábados (Semanales) de 10 a 11 horas-en la Biblioteca de Los Banos, 1312 7th Street. Bilingüe de cuentos, canciones y rimas para niños en edad preescolar y sus Familias. Para los niños es organizado y promovido por el Comité César Chávez. GRATIS! WHAT'S A LIBRARY CARD WORTH? Ever wonder how much you save by having a library card? Click below to use our savings calculator and see how much you save in a year. The following Fact Sheets cover a variety of topics of interest to Friends Groups and library Foundations. If you would like to suggest a topic for a future Fact Sheet, please email bnawalinski@ala.org. OUR MEMBERSHIP DRIVE, PLEASE JOIN US! We invite you join the Friends of the Los Banos Library and support us so we can continue to provide stability and support for our lovely library. Your membership donation will enable us to continue to fund and grow our library. Even with all the budget cuts we have been able to paint the interior of the library, display local artist’s work and provide funding for library personnel’s extra hours. We also make a number of magazine subscriptions available, host a weekly story time and summer reading programs for kids. Adult literacy tutoring is another service we offer the community. Please join us in keeping our library active, vibrant and relevant. Please join us for our monthly meetings at the Library. We meet September through May on the 2nd Wednesday of the month at 6:30pm. Learn about how we're enriching our community by supporting our library and how you can make a difference. We're looking forward to seeing You there! The Los Banos Branch of the Merced County Library is located at 1312 7th Street, Los Banos Ca, 93536. The library phone number is 209-826-5254. The Los Banos Library works hard to serve the community and has the support of over 100 San Joaquin Valley Libraries and is part of the Merced County Library System. The Merced County Library System holds 400,000 items in its collections for patron use. HOW TO GET A LIBRARY CARD Come into the Los Banos Library to register for a library card, and access a world of unlimited information. 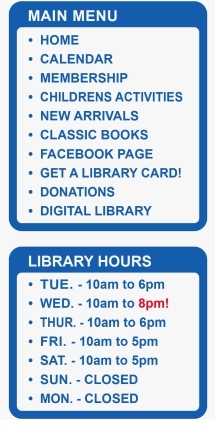 BENEFITS OF A LIBRARY CARD You can use the Online Catalog (ValleyCat) to search all the titles and authors available to adults and young people throughout the San Joaquin Valley Library System (SJVLS). If you don't have a computer at home, come into the library and browse using our ValleyCat computers. If the book or material you want is in the system, you can request it be sent to the Los Banos Library for check out! Whether your interest is fiction or nonfiction, our books and materials have you covered. Add to that the more than three million (and increasing) items in the San Joaquin Valley Library System, and you have an unending source of new information available each day. Copyright © 2012 Friends of the Los Banos Library. All Rights Reserved.